We break down the argument over waiting list figures – and what the government says it will do to clear them (or not). 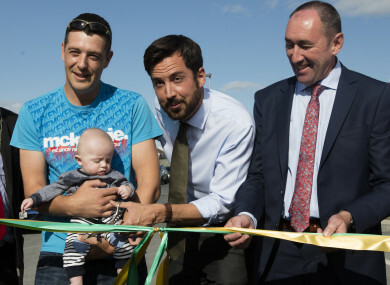 Housing Minister Eoghan Murphy, centre, launching a social housing development in Bagnelstown, Carlow in August. The Government target for new social builds in 2017 is 2,400 units. IRELAND IS IN the grip of a housing crisis. That isn’t our choice of phrase – it’s how the Minister for Housing describes the situation. The country’s failure to build enough homes to meet demand has a lot of consequences, including a rise in prices, rents and homelessness. Here we’re looking at social housing in particular. It’s connected to those other issues, but enough of a problem in its own right to be worth singling out insofar as possible. There is no fixed, universal definition of social housing. It’s widely understood as involving public or non-profit ownership and/or management of housing. But as we’ll see, the government also relies heavily on subsidies to private landlords and considers that a form of social housing. How many social houses do we need? There are almost 92,000 people on the social housing waiting list, according to government figures. Put more technically, 91,600 households qualified for social housing support and weren’t getting it on 21 September 2016. A household can contain multiple people. This doesn’t mean that 92,000 people are on the streets. Just under 6% were on the waiting list because they were “homeless or living in institutional / emergency accommodation”. Fianna Fáil has claimed in the past that government waiting list figures are too low, relying on its own Freedom of Information requests to each council rather than the official assessment. It maintains that the real figure is 130,000. There has also been controversy about people being taken off the list for failing to confirm that they still need housing. Sinn Féin and other opposition politicians, by contrast, are happy enough to go with the government’s data. The Housing Agency has published details of how the waiting list figures are gathered. There were 1.7 million private households in the country in 2016. So around 5% of them are on the waiting list for social housing, assuming the government figures to be correct. What does the government plan to do about it? The Minister for Housing, Eoghan Murphy, has said that “the 90,000 people on the housing list will not all have social housing homes by 2021”. That’s because the government plans to directly house only 47,000 of those people by then under the Rebuilding Ireland strategy. On the other hand, it plans to help another 90,000 or so people with their rent. This happens under two very similar programmes where councils cover some or all of the money due to private landlords. These are the Rental Accommodation Scheme (RAS) and Housing Assistance Payment (HAP). In both cases, the person benefitting still has a tenancy agreement with the landlord. Those qualifying for the main scheme, HAP, are responsible for finding their own accommodation but come off the social housing waiting list. You can debate whether HAP is really “social housing”. It’s designed to replace long-term Rent Supplement – a quarter of people taking up HAP in the first half of 2017 have been transferred over from the existing benefit. People on Rent Supplement weren’t included in the figures for people getting “social housing”, whereas people on HAP are. Then again, it’s a different scheme. Among other things, you can work full-time and still get HAP. As we’ve just touched upon, the number of social homes built depends on what exactly you count. The total number of homes “delivered” hit 19,000 in 2016, from a trough of 4,400 in 2014. That was above the headline target of just over 17,000. Here’s how these 19,000 break down, according to a recent Rebuilding Ireland progress report. Homes provided under capital housing programmes are either built, bought or refurbished by the State. If you think that social housing only counts if it’s State-owned, you’ll care more about capital housing. All told there were 4,900 capital homes provided in 2016, compared to 4,400 in 2015 – a rise of 13%. That’s still considerably below the levels seen before the financial crisis, when even excluding refurbishments, capital numbers were never lower than 6,000. There don’t seem to be figures available for refurbishments until recently, which is why we can’t make an exact comparison. The 2017 target is just under 5,000. Of that, only 2,400 are to be new builds. It’s hard to know whether this is likely to be met, but we do know that 856 homes were at “practical completion” stage in the first quarter of the year. If you don’t much care about how people are housed, so long as they are, you won’t mind throwing current social housing into the mix. This adds RAS tenancies, HAP tenancies, and houses leased from private landlords to be used for social housing. None of these schemes permanently add to the social housing stock. There were around 14,100 current social homes added in 2016. That’s up considerably on the previous year, when there were 9,000. The aim for 2017 is to provide somewhere around 16,000-17,000 (we can’t be exact without confirmation from the Department). That’s principally made up of HAP tenancies, as shown in the chart below from the Rebuilding Ireland Action Plan. That’s on track so far. Around 8,600 people had been signed up HAP in the first half of the year. The Department for Housing has confirmed to FactCheck that the target for overall social housing provision in 2017 – both capital and current – is 21,000. The government sometimes prefers to bundle leases in with capital rather than current housing. For instance, in a recent update on Rebuilding Ireland, it talked about the “social housing construction programme” made up of building, buying, refurbishing and leasing. Leases are also included in the 47,000 target for 2021 that we mentioned at the outset. The opposition can, and will, argue that homes in this latter category shouldn’t be counted. You can make up your own mind about which approach is better. In this article we’re categorising leases as current housing because the home ultimately remains in private ownership, as with RAS and HAP. That’s also the categorisation the government sometimes uses itself. Email “FactFind: What is the state of social house building in Ireland?”. Feedback on “FactFind: What is the state of social house building in Ireland?”.